After defeating Starro, the Leaguers need to find time for their personal lives, which their time as heroes have gotten in the way of. That includes Hal failing to get some important documents out on time, forcing Carol to ground him from flying and Barry being late making dinner for his fiance, Iris. Meanwhile, John meets his partner’s new boyfriend and Aquaman gets in trouble visiting an aquarium. Each of these circumstances has someone visiting them. And at a party for the Justice Society Dinah gets some surprising news, but we the readers aren’t told what just yet. Meanwhile Locus kidnaps Blue Beetle (Dan Garrett) and forces him to be part of their experiments, but they need more test subjects, and the Brotherhood is more than happy to help out. What they got right: An interesting look into the personal lives of the new Justice Leaguers and how their time affects their personal lives. I like that someone actually cared about what Aquaman learned about the fish in the aquarium. What they got wrong: Is every supervillain in the DC Universe during the time this story takes place going to be part of Locus by the end of this story? We’ve already had Vandal Savage and T.O. Morrow previously but we add Professor Ivo, The Brain, Monsieur Mallah, and Madame Rouge join the party this issue. And those last three, the Brotherhood, are Doom Patrol villains more than they are Justice League foes if memory serves. Also, Hal’s a jerk to Snapper and Thomas. And I’m not comfortable watching Dan’s arms be switched with the protoplasmic thing they’re building. It’s a bit disturbing, but that’s a personal complaint, not a critical one. Recommendation: So far it continues to be an interesting story. It may be worth checking out. 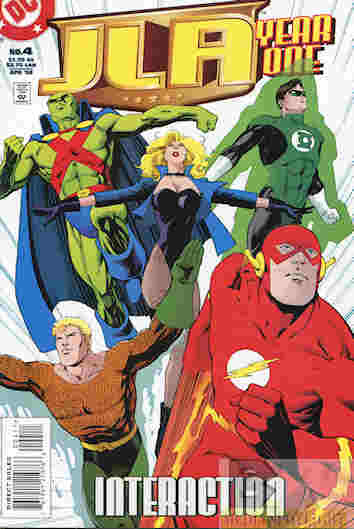 Posted by ShadowWing Tronix on October 8, 2018 in DC Spotlight, Yesterday's Comics and tagged Aquaman, Barry Allen, Black Canary, Blue Beetle, Dan Garrett, DC Comics, DC Universe, Green Lantern, Hal Jordan, Locus, Madame Rouge, Martian Manhunter, Monsieur Mallah, The Brain, The Brotherhood, The Flash.